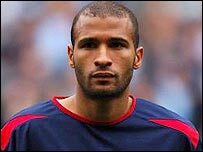 West Brom have signed Diomansy Kamara, who spent last season on loan at Portsmouth, for £1.5m from Modena. Southampton also had a bid accepted for the 24-year-old striker but he decided to stay in the Premiership and sign for boss Bryan Robson at The Hawthorns. The Senegal striker arrived at Fratton Park last summer from the Serie B club - as Pompey's record signing at £2.25m. But Pompey had an escape clause that ensured they recouped £1.5m if they did not keep him for two seasons. Kamara becomes Robson's fourth signing of the summer following the arrivals of Darren Carter, Steve Watson and Chris Kirkland. Robson said: "One of the big reasons we have brought Diomansy on board is because he is very versatile. "He can play in three different positions - wide left, wide right or through the middle as a centre-forward. "He's got loads of pace and on the times I saw him play for Portsmouth last season I thought he looked a real threat. "The sheer pace he has got makes him very dangerous and we are delighted to have him on board." Kamara struggled after his arrival on the south coast, scoring four Premiership goals in 29 appearances. He was not helped by being sidelined for almost three months by a medial knee ligament injury.